One of our newest designs. Created for girls that walk and are celebrating their baptism. Unlike our christening gowns with this dress girls can walk run jump without tripping on the front of their dress. Ages 1 and up, meant for kids that walk and are beyond the christening gown stage. One of our newest designs. Created for girls that walk and are celebrating their baptism. 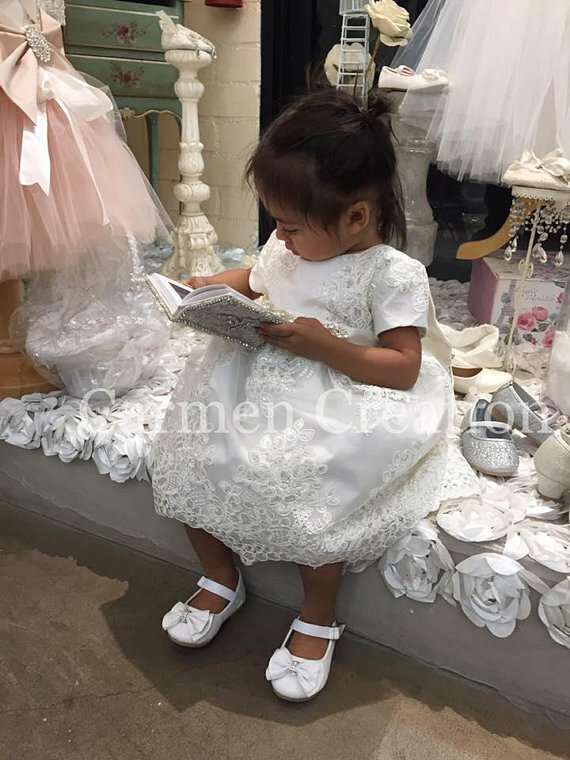 Unlike our christening gowns with this dress girls can walk run jump without tripping on the front of their dress. Ages dress. meant for kids that are beyond the christening gown stage. Fully functional dress is adorned with a rhinestone sash and cute smaller bow for a more delicate feel. Dress features cap sleeves, zipper back, lace in front and back panels of the blouse. A true one of a kind look and feel. Made from chantue, sequence and super soft tulle for volume. Dress is fully lined for comfort. Be aware that lighting may change colors, photographer styles can do that to images, but we guarantee that your dress will still be amazing. Message us for details. Colors, trims and fabrics will very when the exact ones can not be found, similar fabrics, trims and laces will be used. Most decorations are detachable, be aware that they are safety pinned on, customers will alter dress and decorations at their own expense.